From the beginning, this year’s General Assembly session in Virginia felt much different than previous years. Thanks to a historic election and some inspiring activism from climate fighters like you, I left the temporary home of our 140 state representatives at 900 E Main Street feeling hopeful. We didn’t win everything that we wanted — and there is plenty of work to do in the coming months leading up to the 2019 session — but activists around the Commonwealth should take a second to pat themselves on the back for tilting the scales of power a little closer towards justice. For years, CCAN’s top legislative priority has been passing comprehensive legislation called the Virginia Alternative Energy and Coastal Protection Act (VCPA) which would allow the state to join the Regional Greenhouse Gas Initiative (RGGI) in order to cap carbon emissions from power plants and provide revenue for projects that would benefit our most vulnerable communities. Unfortunately, the bill met a familiar fate by dying in committee in both houses on a party-line vote. However, we hit some never-before-seen milestones this year that make passage in 2019 much more likely. The year started off with a huge announcement: In early January, the outgoing McAuliffe Administration teamed up with the incoming Northam Administration to announce that their top environmental priority for 2018 was to join RGGI through legislation! They wisely decided to use the VCPA as this vessel and partnered with CCAN and the larger environmental community to push the bill in the legislature. This announcement was — in no small part — because of relentless activism from CCANers like you over the last four years and it should be a great indicator of what we will be capable of in the years to come. Governor Northam reaffirmed his commitment to RGGI in his first address to a joint session of the General Assembly and he plans to support the bill again in next year’s session. Even with the Governor’s endorsement, the legislative process for the bill didn’t end how we wanted it to. Our best shot for passage was through the Senate Agriculture, Chesapeake Bay, and Natural Resources committee. We had a great patron in Senator Lynwood Lewis (D, Norfolk) who did an excellent job presenting the bill to the committee. But in the end, the bill remained a partisan issue that couldn’t get a crucial vote from a Republican on the committee. However, there is still a silver lining in this defeat. First is that Virginia’s Polluter-In-Chief, Dominion Energy, saw the political writing on the wall and took a neutral position on the bill. They stated to both committees that heard the bill in each house that they could work with the program. This development, along with the Governor’s support, allows us to focus all of our grassroots mite solely on the detractors within the committee throughout the rest of 2018. With fewer foes, I am confident that we will be able to convince a majority of the committee that voting yes on the VCPA is both the morally right thing to do and a politically wise decision. We also have historic regulations coming from the Governor’s Mansion that will be finalized this fall. These regulations will allow Virginia to set a declining cap on emissions and link with the RGGI market. The regulations — known as the Carbon Reduction Plan — cannot invest the market revenue without the General Assembly stepping in. This sets us up to remind the legislators who voted “no” on the bill that they will have to choose between party politics and investing in popular programs like coastal adaptation and economic development in southwest Virginia during an election year. I like our odds in that situation. While we did not win on the VCPA this year, we certainly set the table for a big 2019, and that is something to be proud of. Over the next few months, you’ll be hearing about big actions from CCAN to put more pressure on the legislators we need to vote our way next year. I can’t wait to see our grassroots power grow even more! The most talked about bill in the General Assembly this year was the Dominion Rate Freeze Repeal. This bill dominated the news cycle from the day Dominion Energy snuck it into the legislative docket in late January. The bill was in response to years of horrible press for the company after they pushed through a bill in 2015 that froze base rates on your energy bill — this represents one-third of your actual bill — in exchange for a freeze on regulatory oversight from the State Corporation Commission (SCC). This meant that Dominion could overcharge you on your energy bill and keep the extra profit instead of going through a review process to see if you are owed a refund. The SCC estimates that this legislation could have led to up to $700 million in overcharges since the bill was signed in 2015! Obviously, after years of protests, a pipeline proposal that proved to be a public relations nightmare, and a historic election where over a dozen victorious candidates wouldn’t even take their donations, this bill had to be repealed. So Dominion decided to get ahead of things and introduce a new bill that would be disguised as a repeal, but the first draft would actually be worse than the rate freeze. The bill was a monster. It included over 60 pages of regulatory changes and complicated modifications to the Virginia Code that would change the way the energy monopoly spends YOUR money for a decade. Just like in 2015, the company tried to jam the bill down the legislature’s throat as quickly as possible without a true stakeholder review process. However, what happened after the bill was introduced was unlike anything Dominion has experienced before. Within a week of the announcement, Governor Northam — a man who faced backlash for his own connections to Dominion — stepped in to slow this process down and allow for a true stakeholder negotiation process. This added week of discussion did not do Dominion any favors. While stakeholders fought for improvements to the bill, grassroots groups including CCAN, The Sierra Club, and Appalachian Voices jumped into action, and amazing activists like you answered the call. 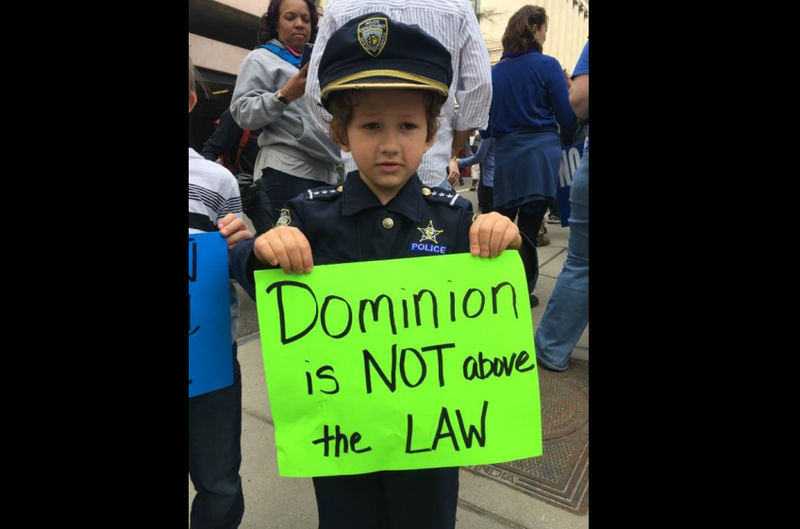 Legislators were flooded with calls that demanded that the bill remove provisions that would double charge consumers for Dominion’s investments and demanded a larger refund. We also demanded real investments in energy efficiency and renewables. The end result was incredible. Dominion bent to the will of the people and added provisions that will guarantee $1B in investments in energy efficiency and the bill now includes a provision that requires every dollar spent on grid modification is matched with spending on renewables. The most dramatic showcase of grassroots power came on the House floor, where Delegate Sam Rasoul (D, Roanoke) and House Minority Leader David Toscano (D, Charlottesville) introduced a floor amendment that would remove Dominion’s ability to charge customers twice for their investments. That amendment eventually passed 96 to 1 — and sent shockwaves through Richmond that were definitely felt in Dominion’s headquarters down the street from the Capitol. The bill eventually passed with all of these improvements and was signed by the governor this month. We still have more work to do in order to make it better for the environment and for ratepayers: we are working with the governor to commission a study on grid modification in order to make sure that these investments will really give Virginia a 21st century grid that incorporates distributed renewables and we will continue to fight a horrible provision in the bill that would allow Dominion to spend $200M in ratepayer money annually on powerline undergrounding without SCC oversight. Even with more work to do, activists like you should be encouraged by this bill. 2018 served as a clear warning to Dominion that they no longer own all of our elected leaders. The list of elected officials who are refusing their money is expanding and the public anger towards the company is growing by the day. Their concessions during this legislative session are only the beginning of a new era of Virginia politics where The People’s House will finally live up to its nickname. The last thing that I wanted to update you on from the 2018 session focuses on our ongoing effort to find a just solution to legacy of the dying coal industry and to stop two fracked gas pipelines. We made some progress on the first issue thanks to Senator Scott Surovell (D, Fairfax). He introduced several bills that aimed to provide a solution to the public health disaster stemming from Dominion’s decision to dump coal ash in ponds that have been proven to harm drinking water around the Commonwealth. The Senate Commerce & Labor Committee agreed on a compromise bill that eventually passed the General Assembly and was signed by the governor. The bill will direct Dominion to put out a request for proposals for recycling the ash; continue the existing moratorium that prevents the state from issuing permits to close the ponds until July 1, 2019; and allows Dominion to close six ponds that have already had ash removed. A legislative study is also planned. This is not a final solution, but we at CCAN will work to make sure that there is a fair study on solutions to coal ash disposal and we will work with our partners to push a just solution to this problem in 2019. The legislature also passed three bills that addressed pipeline construction this year. Two of them, introduced by Senator Creigh Deeds (D, Charlottesville) give the DEQ clear authority to issue stop work orders if they find that pipeline construction adversely impact water quality. The Governor sent down amendments that will make these bills effective immediately, the General Assembly will vote on those amendments on April 18th. Senator Emmett Hanger (R, Harrisonburg) also introduced a bill that will require 401 water permits for future pipelines that are proposed after July 1st, This bill also passed both houses and was signed by the Governor. Both of these bills represent progress in our ongoing effort to fight current and future pipeline projects, but we will need to provide even more pressure on our elected leaders to stop the ACP and MVP! This year’s General Assembly session was a wild ride. While the current landscape of Virgnia state politics isn’t transparent and progressive enough for us to solve the climate crisis, we have certainly swung the pendulum in the direction of progress this year. So take a second to reflect on some real victories and celebrate the fruits of our labor, then, let’s get back to work!